Once you arrive in Delhi, meet an IHPL representative who helps you with an assisted transfer to your hotel. Stay overnight. After breakfast, the second day is for Delhi sightseeing. The list of New Delhi attractions includes Laxmi Narayan Temple, India Gate, Gandhi Memorial and Parliament House. Post lunch, cover the attractions of Old Delhi including Jama Masjid and Red Fort. In the evening, attend Sound and light show. Overnight in Delhi. Begin driving to Jaipur. On reaching, check- in your hotel. The afternoon is free to enjoy the atmosphere of the city – interact with the locals, taste sumptuous Rajasthani delicacies, explore the nearby surroundings on foot, visit the popular local bazaars. Stay overnight. On day 4, after breakfast, proceed to the Amer Fort, situated on a hilltop. Enjoy an elephant ride to go up to its entrance. Once inside, explore its structural elements such as Ganesh Pol, Sheesh Mahal, Sila Devi temple etc. After lunch, continue with sightseeing covering the City palace, Hawa Mahal, Royal Observatory and Nawab Sahab ki Haveli. The last visit is to the bazaar to shop for souvenirs. Stay overnight. Today, hit the road to Ranthmabore National Park, one of India’s largest national parks. The park is home to a good population of the big cats. On arrival, complete the check -in formalities at your lodge. Have lunch and leave for a wildlife safari in the afternoon. Explore the diverse wildlife of the jungle. Return to the lodge for dinner and overnight stay. All of day 6 is scheduled for jungle activities. During the safari, you may spot animal species such as Hulman, Indian wild boar, spotted deer, tiger, Sambar deer, along with around 270 species of birds. You can also indulge in a nature walk. Stay overnight in the lodge. Once you have your breakfast, leave by road for Agra. On the way, stop to explore the old deserted Mughal capital of Fatehpur Sikri, erected by Emperor Akbar in 1569. This UNESCO World Heritage Site, houses several structural elements like Diwan-i-Khas, Jodha Bai Palace, Buland Darwaza, Jama Masjid and Panch Mahal etc. On reaching Agra, complete the check- in formalities at your hotel. Spend the day at leisure. Visit the market to taste the local renditions –Dalmoth and Petha. Stay overnight. In the morning, leave for a city tour. Visit the world-renowned Taj Mahal, constructed by Mughal Emperor Shah Jahan in the memory of his beloved wife Mumtaz Mahal. 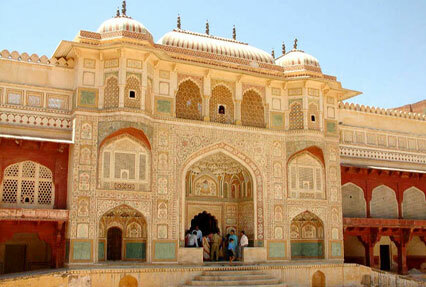 The other visits are Agra Fort and the Tomb of Itmad-ud-Daulah. In the evening, drive to Gwalior. On arrival, check -in your hotel for an overnight stay. The 9th day of the tour is for covering the attractions of Gwalior. Visit Teli Ka Mandir - the oldest temple of the Gwalior Fort constructed during the 11th century, Sas Bahu Temple (Sahastrabahu Temple) – an architectural marvel constructed in 1092 by King Mahipala of the Kachchhapaghata dynasty and Mansingh Palace - a beautiful palace constructed in the 15th century by Raja ManSingh. The last visit is to Jai Vilas Palace Museum – one of the country’s most magnificent palaces, built in 1875 by H. H. Maharaja Jayaji Rao Scindia, the Maharaja of Gwalior. Even in the present times, it is the residence of the former royal Maratha family – The Scindias but a part of it has been converted into a museum. Stay overnight. After breakfast, begin driving towards Shivpuri, the former summer capital of the Scindia rulers of Gwalior. Upon arrival, check- in your hotel. The afternoon is free to relax or indulge in leisure activities like interacting with the locals, relishing the local delicacies and exploring the surroundings on foot. Stay overnight. Day 11, post breakfast, is for a visit to the Madhav National Park, one of those national parks in India that is open throughout the year. The park is home to a variety of antelopes like Chowsinga, Nilgai and Chinkara as well as Deer including species like Barking Deer, Chital and Sambar. The other animal species that you can spot during the safari include Leopard, Porcupine, Wolf, Fox, Wild Dog, Jackal, Wild Pig, Python and Marsh Crocodile. You can also enjoy boating in the Sakhya Sagar Lake. Stay overnight. The morning of day 12 is for visiting Karera Bird Sanctuary that houses around 245 species of birds. This sanctuary is home to the ever elusive avifauna species- the Great Indian Bustard. Indulge in Bird watching where you may spot bird species like black-bellied river terns, egrets as well as spoonbills etc. After lunch, begin driving to Orchha. On reaching, check- in your hotel. The day is free for leisure activities. Stay Overnight. The 13th day of the tour is for covering the attractions in Orchha. 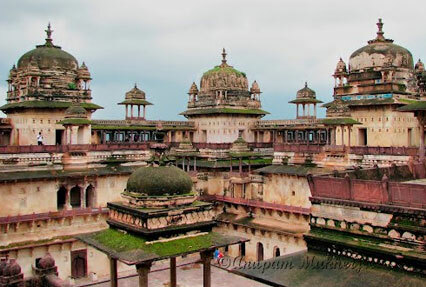 Visit Jahangir Mahal, also known as Rani Mahal – a beautiful palace erected during the 17th century, Raj Mahal – constructed during the 17th century, this palace was the royal residence of the erstwhile kings of Orchha and Phool Bagh – a garden erected as a memorial for the Prince of Orchha, Dinman Hardaul. Stay overnight. After breakfast, begin driving to Khajuraho. On arrival, complete the check -in formalities at your hotel. After lunch, explore the UNESCO World Heritage Site of Eastern and Western Group of temples that includes Laxmi and Varha Temples, Kandariya Mahadev, Devi Jagdamba temples. Glorifying erotica, these temples were erected during the reign of Chandela rulers. Stay overnight. On day 15, leave by road for Bandhavgarh National Park. 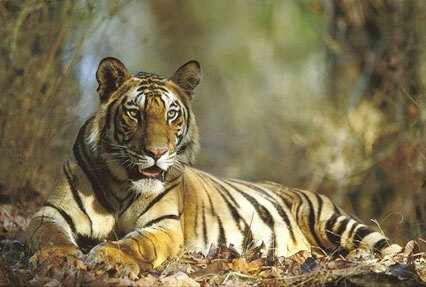 One of the country’s most well-known parks, it has one of the highest densities of tiger population. It also has a large breeding population of different species of deer and leopards. Once you arrive, complete the check -in formalities at your tourist resort. Embark on a wildlife safari in the afternoon. Stay overnight. All of day 16 is for wildlife viewing at the park. You can opt for a jeep or an elephant safari. During your safari, you may spot animal and bird species like Wild Boar, Jackal, Fox, Muntjac, Black faced langurs, Porcupines, Vipers, Cobras, Hyenas Red Wattled Lapwing, White Breasted Kingfisher etc. 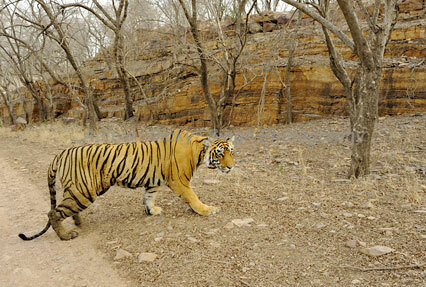 Also visit the Bandhavgarh Fort. If the legends are to be believed, this fort was erected by Lord Rama, when he was coming back from Lanka after defeating Ravana. Stay overnight. 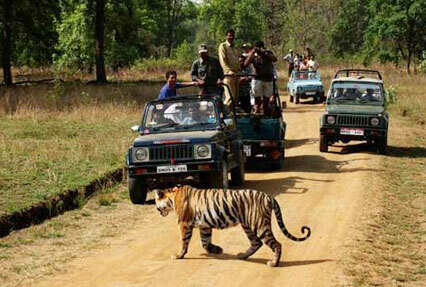 Begin driving to Kanha National Park. On reaching, complete the check- in formalities at your lodge. This national park has been the inspiration behind “The Jungle Book”, a popular novel by Rudyard Kipling. In the evening, participate in a wildlife safari into the park. Overnight in Kanha. From morning till evening, enjoy a wildlife safari into the park. Kanha is home to a great population of Barasingha (Swamp Deer) that is also called as ‘Jewel of Kanha’. During your safari, you spot various kinds of animal species such as Tiger, Indian Porcupine, Sloth Bear, Wild Boar, Hyena, Gaur, Indian Wolf, Flying Squirrel, Greater False Vampire and more. Overnight stay. Today, after breakfast, hit the road to Raipur, the capital of Chhattisgarh. Once your reach, check- in your hotel. The rest of the day is free for leisure activities- explore the nearby surroundings on foot, visit the market or the city’s attractions, relish the local delicacies etc. Stay overnight. Get on-time transfer to the airport to board a flight to Delhi. On reaching, get transferred to your hotel to freshen-up and relax. After dinner, get transferred to the airport. Get an assisted transfer to the International Airport to board a flight for your onward journey.